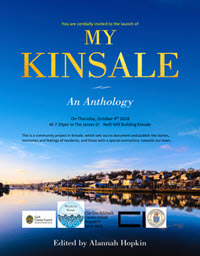 My Kinsale is a community project in Kinsale to document and publish the stories, memories and feelings of residents, and those with a special connection, towards our town. This project, under the auspices of Words By Water, Kinsale’s literary festival, in association with the Kinsale Chamber of Tourism and Business, is designed to capture the thoughts, feelings and memories of the people of Kinsale, old and young, for use in a digital publication with a paper version also available. We have received some funding from Creative Ireland, and the project is being supported by Words By Water 2018, and by copy sales of the finished book. This is the first edition and represents a growing cultural archive including photographic and written histories of Kinsale, its people and place, including creative and factual written work edited by local professional writer, editor and journalist, Alannah Hopkin. The book is filled with Creative input from people of all ages, including short commentaries, stories, poems and historical commentaries about Kinsale. Supported by Cork County Council, Creative Ireland and in association with Kinsale Chamber of Tourism and Business.